Wonder and Skepticism in the Middle Ages explores the response by medieval society to tales of marvels and the supernatural, which ranged from firm belief to outright rejection, and asks why the believers believed, and why the skeptical disbelieved. Despite living in a world whose structures more often than not supported belief, there were still a great many who disbelieved, most notably scholastic philosophers who began a polemical programme against belief in marvels. 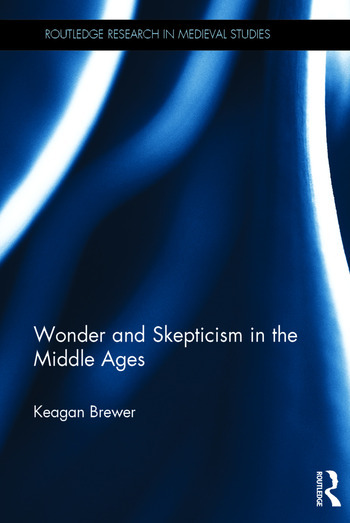 Keagan Brewer reevaluates the Middle Ages’ reputation as an era of credulity by considering the evidence for incidences of marvels, miracles and the supernatural and demonstrating the reasons people did and did not believe in such things. Using an array of contemporary sources, he shows that medieval responders sought evidence in the commonality of a report, similarity of one event to another, theological explanations and from people with status to show that those who believed in marvels and miracles did so only because the wonders had passed evidentiary testing. In particular, he examines both emotional and rational reactions to wondrous phenomena, and why some were readily accepted and others rejected. This book is an important contribution to the history of emotions and belief in the Middle Ages. Keagan Brewer is based at the Centre for Medieval and Early Modern Studies at the University of Sydney. His previous publications include Prester John: the Legend and its Sources (2015). "This is an intriguing study of marvels, miracles and wonder stories and the ways medieval people responded to them. Brewer integrates studies in neuroscience, modern social psychology, and reception theory to investigate how readers and listeners reacted to stories of wonder, and to show how their demands for proof contributed to the development of medieval skepticism."